When choosing your putter it is vital that you choose the correct type of putter which is determined by your putting style. Even complete beginners have a certain type of stroke, and the best person to help you determine this is your local friendly PGA professional. Their advice is free of charge, and they don’t usually bite! The second factor you need to take into account when choosing your putter is the alignment aids which will help you line your putt up. These can be quite personal and there are many different types of putters and different styles so there’s not really a right or wrong answer to this – you need to look at a few different types of putters and just see what works best for you. The third most important element is referred to as the ‘offset’. It’s a measure of how far the shaft is positioned in front of the actual club face. When you strike your putt, it’s ideal for your hands to be slightly in front of the club head to get the correct strike on the ball. The amount of offset you need is determined by your individual putting stroke so again your best bet is to seek advice from a PGA professional. What technology does the putter have and is the technology proven? Once you’ve chosen a few possible putters that suit your style (and pocket! 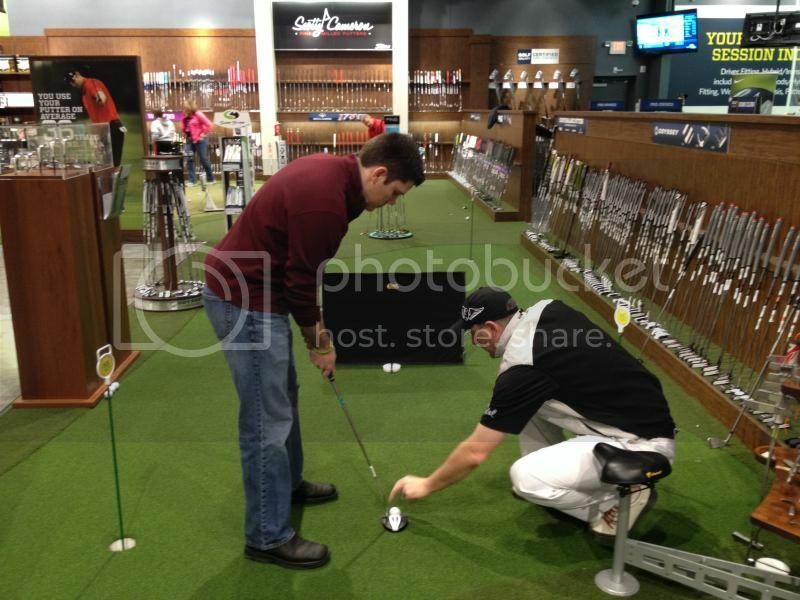 ), you need to make sure that you perform a putter test before making your final decision. There are a number of factors you need to test, but bear in mind that the best putter for you is not necessarily the one you happen to hole the most putts with during your testing. Some of that might be down to a bit of luck! To perform your putter test take a putt with each putter you’re considering and ask yourself what you liked and dis-liked about each putter, even if you don’t hole the putt. Award each putter a score out of 10 and eliminate the lowest scoring putter in each ’round’ until you are down to two. How did it feel to you ? Did it feel ‘wooden’, ‘soft’, ‘hard’ ? And which one did you prefer? How easy did you find it to align the putt? When you are performing the putter test, don’t worry too much about how comfortable it feels. The putter could be slightly too long or the grip could be the wrong size, but these can be adjusted if you decide to purchase the putter. If you can’t decide between two or more putters, then you need to start comparing the price and possibly even the manufacturer. This is probably the most crucial element to get right since it affects your posture and stance over the ball and also how far you stand away from the ball. It also influences how comfortable the putter is. The sole (bottom) of the putter should lie flat on the ground when you address the ball. If the toe or heel are pointing in the air it will make striking the ball well a lot harder. Some companies use extremely expensive equipment to fit a putter, but most PGA professionals will be able to help you either using their experience or by using a club especially designed to measure the perfect fit for you. It should be a free service if you purchase your putter from them, and the adjustments should be complete within a day or so. There are other factors that can be adjusted including the grip size and weight.